In Canada, a lieutenant governor (/lɛfˈtɛnənt/; French [masculine]: lieutenant-gouverneur, or [feminine]: lieutenant-gouverneure) is the viceregal representative in a provincial jurisdiction of the Canadian monarch and head of state, Queen Elizabeth II. On the advice of his or her prime minister, the Governor General of Canada appoints the lieutenant governors to carry out most of the monarch's constitutional and ceremonial duties for an unfixed period of time—known as serving at His Excellency's pleasure—though five years is the normal convention. Similar positions in Canada's three territories are termed Commissioners and are representatives of the federal government, however, not the monarch directly. The offices have their roots in the 16th and 17th century colonial governors of New France and British North America, though the present incarnations of the positions emerged with Canadian Confederation and the British North America Act in 1867, which defined the viceregal offices as the "Lieutenant Governor of the Province acting by and with the Advice the Executive Council thereof." However, the posts still ultimately represented the government of Canada (that is, the Governor-General-in-Council) until the ruling in 1882 of the Lord Watson of the Judicial Committee of the Privy Council in the case of Maritime Bank v. Receiver-General of New Brunswick, whereafter the lieutenant governors were recognized as the direct representatives of the monarch. The Constitution Act, 1982 provides that any constitutional amendment that affects the office of the lieutenant governor requires the unanimous consent of each provincial Legislative Assembly as well as the House of Commons and the Senate. The position of lieutenant governor has existed in Canada since before the country's confederation. In 1786, the post of Governor-in-Chief of British North America was created as a central viceregal office overseeing the British colonies of Prince Edward Island, Nova Scotia, New Brunswick, and the Province of Quebec, whose governors then became lieutenant governors, though that of Quebec was occupied simultaneously by the governor-in-chief. This structure remained in place until the partitioning in 1791 of the Province of Quebec into Upper and Lower Canada, which then each had an office of lieutenant governor, though both posts were occupied by the incumbent Governor General of the Province of Canada. Beginning immediately after confederation, the Dominion government and the Colonial Office in London considered the lieutenant governors as representatives of, and subordinate to, the governor general in Ottawa, reflecting the view of John A. Macdonald and the Earl of Derby, who set up the Constitution Act, 1867, so as to have the lieutenant governors appointed by the governor general, and who expected that Royal Assent would be given in the name of the governor general, rather than the Queen. A ruling by the Judicial Committee of the Privy Council in 1882, however, altered this view, establishing that the lieutenant governors represented the Queen in the provinces as much as the governor general did in the federal jurisdiction. Unlike the federal viceroy, the Canadian lieutenant governors have been since 1867, if not Canadian-born, at least long-time residents of Canada and not of the peerage, though a number, up until the Nickle Resolution in 1919, were knighted. While required by the tenets of constitutional monarchy to be nonpartisan during their time in office, lieutenant governors have frequently been former politicians and some have returned to politics following their viceregal service. 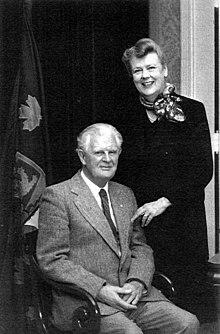 Canadian lieutenant governorships have also been used to promote women and minorities into a prominent position: The first female viceroy in Canada was Pauline Mills McGibbon, Lieutenant Governor of Ontario from 1974 to 1980, and many women have since served in both that province and others. There have been two Black (Lincoln Alexander and Mayann E. Francis) and several Aboriginal lieutenant governors. Norman Kwong, Lieutenant Governor of Alberta from 2005 to 2010, was Chinese-Canadian and David Lam, the Lieutenant Governor of British Columbia from 1988 to 1995, was Hong Kong-Canadian. Former Lieutenant Governor of Quebec Lise Thibault used a wheelchair, while David Onley, the former Lieutenant Governor of Ontario, had polio as a child and used crutches or a scooter. The lieutenant governors are appointed by the Governor General of Canada on the advice of the prime minister. Since 2012, the Advisory Committee on Vice-Regal Appointments has deliberated on candidates for forthcoming vacancies, and prepared a non-binding shortlist of candidates for the Prime Minister to consider. There is no constitutional requirement or consistent practice for the Prime Minister to consult with the province's premier on the appointment of the lieutenant governor. Besides the administration of the oaths of office, there is no set formula for the swearing-in of a lieutenant governor-designate. Though there may therefore be variations to the following, the appointee will generally travel to the legislative assembly building in the provincial capital, where a guard of honour awaits to give a general salute. From there, the party is led by the speaker of the legislative assembly to the legislative chamber, wherein all justices of the province's superior court, members of the legislative assembly, and other guests are assembled. The governor general's commission for the lieutenant governor-designate is then read aloud, and the required oaths are administered to the appointee by either the governor general or a delegate thereof; the three oaths are: the Oath of Allegiance, the Oath of Office as lieutenant governor, and the oath as keeper of the province's great seal. With the affixing of their signature to these three solemn promises, the individual is officially the lieutenant governor, and at that moment the Viceregal Salute is played and a 15-gun salute is conducted outside. The lieutenant governor then receives the insignia of the province's order or orders. Since the appointment in 1956 of John J. Bowlen as Lieutenant Governor of Alberta, newly installed lieutenant governors will, at some point in the first year of their mandate, be invited to a personal audience with the monarch. The governor general also has the power to appoint a person as "administrator", to act in the place of a lieutenant governor who is unable to act, for example due to illness or absence from the province. Since 1953, the practice has been that the chief justice of the province has a standing appointment to act as administrator. However, if the position of lieutenant governor is vacant, for example due to the death of the lieutenant governor, the administrator is not able to act until a new lieutenant governor is appointed. This situation arose in Saskatchewan in 1978, when the Lieutenant Governor, George Porteous, died suddenly on February 6, 1978. The administrator, Chief Justice Culliton, declined to exercise any powers of the Lieutenant Governor, on the basis that he had no power to act when the office was vacant. The federal Department of Justice and the Prime Minister's Office took the same position. As a result, the Saskatchewan Government could not recall the prorogued Legislative Assembly, nor pass any orders-in-council to proclaim statutes in force, pass regulations, or exercise any other statutory powers requiring an order-in-council. This situation lasted until the federal government appointed Porteous's successor, Irwin McIntosh, on February 22, 1978. As the Canadian monarch is shared equally amongst the ten provinces of Canada, as well as the federal realm, and the sovereign lives predominantly outside Canada's borders, a lieutenant governors' primary task is to perform the sovereign's constitutional duties on his or her behalf, acting within the principles of parliamentary democracy and responsible government as a guarantor of continuous and stable governance, and as a nonpartisan safeguard against the abuse of power. The office is the core of authority in a province. For the most part, however, the powers of the Crown are exercised on a day-to-day basis by elected and appointed individuals, leaving the lieutenant governors to perform the various ceremonial duties the sovereign otherwise carries out when in the country; at such a moment, a lieutenant governor will decrease his or her public appearances, though the presence of the monarch does not undermine any lieutenant governor's ability to perform governmental roles. The lieutenant governor alone is also constitutionally mandated to summon the legislature. Beyond that, the viceroy carries out the other conventional parliamentary duties in the sovereign's stead, including reading the Speech From the Throne and proroguing and dissolving parliament. The lieutenant governor also grants Royal Assent in the Queen's name; legally, he or she has three options: grant Royal Assent (making the bill law), withhold Royal Assent (vetoing the bill), or reserve the bill for the signification of the governor general's pleasure. If the governor general withholds the Queen's assent, the sovereign may within two years disallow the bill, thereby annulling the law in question. R. MacGregor Dawson opined that, following Confederation, the lieutenant governors diverged from the governor general in that they continued to demonstrate a power independent of the Cabinet and parliament; lieutenant governors had variously dismissed governments, refused the advice of ministers, and insisted on the creation of royal commissions. Altogether, lieutenant governors had also withheld Royal Assent to bills 28 times and reserved bills for the consideration of the governor general 71 times. The last example of the former was, however, in 1945 and the latter in 1961. [n 7] Relations between lieutenant governor and Cabinet have also at times been strained by ministers' unwillingness to openly acknowledge the authority of a federal appointee, often recommended by a federal prime minister who adhered to different political beliefs. 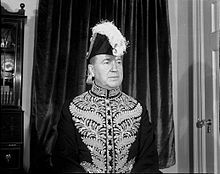 With most constitutional functions lent to cabinet, a lieutenant governor acts in a primarily ceremonial fashion, carrying out some of the ritual duties normally associated with heads of state and thus symbolizing the sovereignty of the provinces within confederation. The provincial viceroys have been said to be, outside of Quebec, "a focus of community ideals and a reinforcement of provincial identity." He or she will host members of the Canadian Royal Family, as well as foreign royalty and heads of state, and is also tasked with fostering national unity and pride. One way in which this is carried out is travelling the province and meeting with residents from all regions and ethnic groups, some of whom a lieutenant governor will induct into the province's orders and present to others medals and decorations. This travel takes place mostly within a lieutenant governor's province, the viceroys rarely performing state duties anywhere else in Canada, and never internationally, unless it is on behalf of the monarch in a federal capacity;[n 8] it has been argued that the provincial representatives of the Queen should start to undertake trips to represent their province abroad. In the exercise of these duties, the lieutenant governors may sometimes receive advice from the Department of Canadian Heritage Ceremonial and Canadian Symbols Promotion Program. During a provincial election, a lieutenant governor will curtail these public duties, so as not to appear as though they are involving themselves in political affairs. The viceroys themselves also offer awards, such as the Lieutenant Governor's Award for Outstanding Service to Rural Saskatchewan, the Lieutenant Governor's Nova Scotia Talent Trust Award, and the Lieutenant Governor's Award for Excellence in Architecture, awarded in New Brunswick, and the Heritage Canada Foundation also presents the Lieutenant Governor's Award, presented to an individual or group who has achieved an outstanding result in heritage conservation in the province in which the Heritage Canada Foundation's annual conference is held. Further, the lieutenant governors (as well as the territorial commissioners) present the Vice-Regal and Commissioners' Commendation to individuals who offer their service—paid or volunteer—to the viceregal offices. It was originally intended to be a distinction in place of appointment to the Royal Victorian Order, regularly granted to those who aided the monarch or governor general with distinction, but nominees from the lieutenant governors were frequently overlooked by staff at Rideau Hall. However, after 1984, suggestions from the lieutenant governors' offices for membership in the Royal Victorian Order were more readily accepted and the Vice-Regal and Commissioners' Commendation became an award for one or more commendable acts benefiting the viceroy. As the personal representative of the monarch, a lieutenant governor follows only the sovereign in the province's order of precedence, preceding even other members of the Royal Family. Though the federal viceroy is considered Primus inter pares amongst his or her provincial counterparts, the governor general also takes a lower rank to the lieutenant governors in the provincial spheres; at federal functions, however, the governor general, as the Queen's representative in the country, precedes the lieutenant governors. An incumbent lieutenant governor is also entitled to the use of the style His or Her Honour, and is granted the additional honorific of The Honourable for their time in office and for life afterwards. Traditionally, lieutenant governors were entitled to wear first-class court uniform. Today, the practice continues in some provinces, such as Nova Scotia, Alberta, and British Columbia. Since 1999, lieutenant governors have been entitled to wear a special badge of office. Per the orders' constitutions, the lieutenant governors, except for that of Quebec, serve as the chancellor of their province's order. They also upon installation automatically become a Knight or Dame of Justice and a Vice-Prior in Canada of the Most Venerable Order of the Hospital of Saint John of Jerusalem. All of these honours are retained following an incumbent's departure from office, with the individual remaining in the highest category of the order, and they may also be further distinguished with induction into other orders or the receipt of other awards. The Viceregal Salute—composed of the first six bars of the Royal Anthem ("God Save the Queen") followed by the first and last four bars of the national anthem ("O Canada")—is the salute used to greet a lieutenant governor upon arrival at, and mark his or her departure from most official events. To mark a viceroy's presence at any building, ship, airplane, or car in Canada, the relevant lieutenant governor's flag is employed. Excepting those of Quebec and Nova Scotia, the present form of most provincial viceroyal flags was adopted in 1980 and consists of a blue field bearing the shield of the province's coat of arms surrounded by ten gold maple leaves—each symbolizing one province—surmounted by a St. Edward's Crown. In a provincial jurisdiction, the lieutenant governor's flag takes precedence over all other flags, save the Queen's personal Canadian standard, and is also, along with all flags on Canadian Forces property, flown at half-mast upon the death of an incumbent or former lieutenant governor. In the Canadian context, there are numerous, and not mutually agreeable, notions regarding hyphenation and capitalization of the position title. Various acts in the Canadian constitution and numerous provincial websites typically indicate Lieutenant Governor of [Province] (upper case and no hyphen), likely due to the primacy of those positions in their respective jurisdictions. However, The Canadian Style indicates Lieutenant-Governor (upper case with hyphen), though lieutenant-governors (lower case and hyphenated) when pluralized. The Guide to Canadian English Usage equivocates somewhat, indicating upper case only when used in and associated with a specific provincial lieutenant governor or name (e.g., Lieutenant-Governor Lincoln Alexander), not generally, and varied use. In French, the term is always hyphenated. Also, as governor is the main noun in the title, it is the word that is pluralized; thus, it is lieutenant governors, rather than lieutenants governor. ^ The Governor of the United Colonies of Vancouver Island and British Columbia became in 1871, through an Order in Council by Queen Victoria, the Lieutenant Governor of British Columbia; the Governors of Prince Edward Island became in 1873, by Order in Council of the Queen, the Lieutenant Governor of Prince Edward Island; and the Commission Governor of Newfoundland became in 1949, through the Newfoundland Act, the Lieutenant Governor of Newfoundland. ^ The office of the Lieutenant Governor of Manitoba was created in 1870 by the Manitoba Act, the office of the Lieutenant Governor of Alberta was created in 1905 by the Alberta Act, and the office of the Lieutenant Governor of Saskatchewan was created in 1905 by the Saskatchewan Act. ^ Robert Brett acted as Lieutenant Governor of Alberta between 1915 and 1925 and Lise Thibault served as Lieutenant Governor of Quebec from 1997 to 2007. ^ Lieutenant Governor of Quebec Jean-Louis Roux resigned the viceregal post in 1997 due to controversy. ^ For example, Lieutenant Governor of Alberta Lois Hole died of cancer on 6 January 2005, and Lieutenant Governors of Nova Scotia Frank Stanfield and David MacKeen died on 25 September 1931 and 13 November 1916, respectively. Further, Lieutenant Governor of Quebec Paul Comtois died in the fire that destroyed the province's viceregal residence on 21 February 1966. ^ See Note 1 at Queen's Privy Council for Canada. 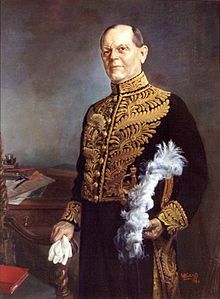 ^ Lieutenant Governor of Alberta John C. Bowen in 1937 refused to grant Royal Assent to three bills passed by William Aberhart's Social Credit government on the grounds that they were unconstitutional, and Lieutenant Governor of Saskatchewan Frank Lindsay Bastedo in 1961 reserved Royal Assent to the Mineral Contracts Alteration Act, passing it on, instead, to the Governor General for consideration. ^ For example, Lieutenant Governor of Ontario David Onley represented the Queen and Canada at the 2008 Summer Paralympics opening ceremony in Beijing, China. ^ Victoria (29 March 1867). "Constitution Act, 1867". V.58. Westminster: Queen's Printer. Retrieved 15 January 2009. ^ a b Saywell, John T. (1957). The Office of Lieutenant Governor: A Study in Canadian Government and Politics. Toronto: University of Toronto Press. pp. 13–14. ^ a b Kenney, Jason (23 April 2007). "Talking Points for The Honourable Jason Kenney". Queen's Printer for Canada. Archived from the original on 11 June 2011. Retrieved 14 May 2009. ^ Smith, David E. (1995). The Invisible Crown. Toronto: University of Toronto Press. p. 8. ISBN 0-8020-7793-5. ^ a b Watson, William (1892). "Maritime Bank v. Receiver-General of New Brunswick". Written at London. In Jackson, Michael (ed.). Golden Jubilee and Provincial Crown (PDF). Canadian Monarchist News. 7. Toronto: Monarchist League of Canada (published 2003). p. 6. Archived from the original (PDF) on 8 July 2009. Retrieved 11 June 2009. ^ Victoria (16 May 1871). "British Columbia Terms of Union". 10. Westminster: Queen's Printer. Retrieved 16 June 2009. ^ Victoria (26 June 1873). "Prince Edward Island Terms of Union". Schedule. Westminster: Queen's Printer. Retrieved 16 June 2009. ^ George VI (23 March 1949). "Newfoundland Act". 8.1. Ottawa: King's Printer for Canada. Retrieved 16 June 2009. ^ Legislative Assembly of Alberta. "Public Information > Lieutenant Governors > The Lieutenant Governor of the Northwest Territories". Queen's Printer for Alberta. Retrieved 23 June 2009. ^ Victoria (12 May 1870). "Manitoba Act, 1870". 6. Westminster: Queen's Printer. Retrieved 16 June 2009. ^ Edward VII (20 July 1905). "Alberta Act". 10. Westminster: King's Printer. Retrieved 16 June 2009. ^ Edward VII (20 July 1905). "Saskatchewan Act". 10. Westminster: King's Printer. Retrieved 16 June 2009. ^ Jackson, Michael D. (2003). "Golden Jubilee and Provincial Crown" (PDF). Canadian Monarchist News. Toronto: Monarchist League of Canada. 7 (3): 6. Archived from the original (PDF) on July 8, 2009. Retrieved 11 June 2009. ^ "Committee willl select candidates for vice-regal appointments". CTV News. The Canadian Press. 5 November 2012. ^ "New Advisory Committee on Vice-Regal Appointments". Prime Minister of Canada. 4 November 2012. Archived from the original on 5 October 2013. ^ D. Michael Jackson. The Crown and Canadian Federalism. p. 127. ^ "The Manual of Official Procedure of the Government of Canada" (PDF). ^ Munro, Kenneth (2005). The Maple Crown in Alberta: The Office of Lieutenant Governor. Victoria: Trafford Publishing. p. iii. ISBN 1-4120-5317-X. ^ Munro, Kenneth (2005). The Maple Crown in Alberta: The Office of Lieutenant Governor. Victoria: Trafford. ISBN 978-1-4120-5317-4. ^ John T. Saywell, The Office of the Lieutenant-Governor, (revised edition (Toronto: Copp, Clark Pitman, 1986)), p. 170, citing papers in the Department of State, Ottawa. ^ Office of the Lieutenant Governor of Ontario. "Protocol and Ceremony > Administrator". Queen's Printer for Ontario. Archived from the original on 12 June 2011. Retrieved 17 June 2009. ^ Office of the Lieutenant Governor of Quebec. "Roles and Functions > Administrator of the Government". Éditeur officiel du Québec. Archived from the original on 12 October 2009. Retrieved 19 June 2009. ^ Legislative Assembly of Alberta. "Public Information > Lieutenant Governors > The Office of Lieutenant Governor". Queen's Printer for Alberta. Retrieved 23 June 2009. ^ Mike Doyle, "Porteous replacement likely soon", Star-Phoenix, Feb 8, 1978, p. 3. ^ Philippe Doré, Clerk of the Executive Council, "Saskatchewan: Lieutenant Governor's death causes constitutional problems", The Parliamentarian, LIX No 3, July 78, p. 176. ^ Roberts, Edward (2009). "Ensuring Constitutional Wisdom During Unconventional Times" (PDF). Canadian Parliamentary Review. Ottawa: Commonwealth Parliamentary Association. 23 (1): 15. Retrieved 21 May 2009. ^ MacLeod, Kevin S. (2008). A Crown of Maples (PDF) (1 ed.). Ottawa: Queen's Printer for Canada. pp. 16, 20. ISBN 978-0-662-46012-1. ^ Webber, Jeremy (1997). "The Legality of a Unilateral Declaration of Independence under Canadian Law" (PDF). The McGill Law Journal. Montreal: McGill University. 42 (2): 288. Archived from the original (PDF) on 6 July 2011. Retrieved 3 March 2011. ^ Department of National Defence (1 April 1999). "The Honours, Flags and Heritage Structure of the Canadian Forces" (PDF). Ottawa: Queen's Printer for Canada: 1A–3. A-AD-200-000/AG-000. Archived from the original (PDF) on 25 March 2009. Retrieved 23 May 2009. ^ McWhinney, Edward (2005). 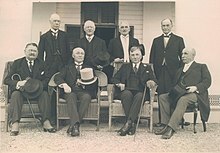 The Governor General and the Prime Ministers. Vancouver: Ronsdale Press. pp. 16–17. ISBN 1-55380-031-1. ^ Dawson, R. MacGregor; Dawson, W.F. (1989). Democratic Government in Canada (5 ed.). Toronto, Buffalo, London: University of Toronto Press. pp. 68–69. ISBN 0-8020-6703-4. ^ Forsey, Eugene (2005). How Canadians Govern Themselves (PDF) (6 ed.). Ottawa: Queen's Printer for Canada. pp. 4, 34. ISBN 0-662-39689-8. Archived from the original (PDF) on 25 March 2009. Retrieved 14 May 2009. ^ Library and Archives Canada. "Politics and Government > By Executive Decree > The Governor General". Queen's Printer for Canada. Archived from the original on 5 January 2010. Retrieved 18 May 2009. ^ Office of the Governor General of Canada. "Governor General of Canada: Role and Responsibilities of the Governor General". Queen's Printer for Canada. Archived from the original on 11 December 2007. Retrieved 18 May 2009. ^ a b c Boyce, Peter John (2008). The Queen's Other Realms: The Crown and Its Legacy in Australia, Canada and New Zealand. Sydney: Federation Press. p. 102. ISBN 9781862877009. ^ Jackson, Michael (2006). "Bastedo, Frank Lindsay (1886–1973)". The Encyclopedia of Saskatchewan. University of Regina. Retrieved 18 May 2009. ^ Diefenbaker, John G. (1976). One Canada: The Years of Achievement, 1957–1962. II. Toronto: Macmillan of Canada. p. 56. ISBN 978-0-333-23516-4. ^ Boyce, Peter (2008). The Queen's Other Realms: The Crown and its Legacy in Australia, Canada and New Zealand. Sydney: Federation Press. p. 100. ISBN 978-1-86287-700-9. ^ "Statement by the Prime Minister of Canada" (Press release). Queen's Printer for Canada. 26 August 2008. Archived from the original on 9 March 2010. Retrieved 8 March 2010. ^ Jackson, Michael (2009). "The Senior Realms of the Queen" (PDF). Canadian Monarchist News. Toronto: Monarchist League of Canada. Autumn 2009 (30): 9. ^ Department of Canadian Heritage (31 March 1998). "Performance Report" (PDF). Queen's Printer for Canada. Archived from the original (PDF) on 27 February 2008. Retrieved 14 August 2006. ^ "Heritage Services > Awards > Lieutenant Governor's Award for Outstanding Achievement in Heritage Conservation at the Provincial/Territorial Level". Heritage Canada Foundation. Retrieved 15 June 2009. ^ Office of the Lieutenant Governor of Nova Scotia. "Government House > Vice-Regal and Commissioners' Commendation". Queen's Printer for Nova Scotia. Retrieved 1 November 2012. ^ a b Department of Canadian Heritage. "Ceremonial and Canadian Symbols Promotion > Across Canada > Standards". Queen's Printer for Canada. Retrieved 19 June 2009. ^ "Titles". Canadian Heritage. Government of Canada. Retrieved 28 February 2016. ^ "Table of Titles to be used in Canada". Government of Canada. Government of Canada. Retrieved 28 February 2016. ^ "Canada Wide > About Us > The Order of St. John > The Order of St. John in Canada". St. John Ambulance Canada. Retrieved 2 June 2009. ^ Department of Canadian Heritage. "Ceremonial and Canadian Symbols Promotion > Honours and salutes > Musical salute". Queen's Printer for Canada. Retrieved 3 June 2009. ^ Public Works and Government Services Canada (1997). The Canadian Style. Hamilton: Dundern Press. p. 46. ISBN 978-1-55002-276-6. ^ Fee, Margery; McAlpine, Janice (3 April 2007). Guide to Canadian English Usage. New York: Oxford University Press. p. 244. ISBN 978-0-19-542602-1. This page was last edited on 16 October 2018, at 21:58 (UTC).